Following on from the ‘Getting to Know You’ questionnaire started by Mandy at The Complete Book, Judy at Savoring Today and Chef Mimi, here are my answers to part 2 of the questionnaire. Twitter or Blog if you like what we do. We also have a double birthday celebration because our model and beloved rescue cat Miles has now been with us for two years. He’s spoilt rotten so obviously he has two birthdays a year, his actual birthday and then a second one celebrating his arrival as part of our family (this month). When I talk to people about SurreyKitchen they always mention the cat so here’s to Miles! Q1) What 5 items are always in your fridge? A) Garlic because I put it in everything and it is sooo good for you. Fresh chillies from my greenhouse for the same reason. Cheese because unless it is there my husband would complain there was no food in the house even when the fridge is stacked high. Mushrooms because I have a bit of a mushroom fetish and will squeeze them into any recipe I can. Lastly milk as me and my husband are both big tea drinkers. Q2a) What 5 items are always in your pantry? A) Marmite because my husband would die without it. He has a backup jar for the backup jar just incase! Tins of tomatoes because what cook can function without them? Tea bags, there is a never-ending supply in our house. Sugar for baking and finally Arborio rice as I adore risotto. Q2b) What five items are always in Miles’ cupboard. A) Miles is a very important part of the SurreyKitchen team. So I thought for a laugh I would share with you the secrets of the most important cupboard in our kitchen, the cat cupboard! Dreamies – useful for bribery when we wish to brush him, give him medication, or distract him from doing that thing he knows he shouldn’t be doing. Cat sticks – a bit like a chewy stick for a dog. These are Miles’ favourite and he guards them fiercely from his arch nemesis the ‘ginger cat’ who did come through the old cat flap before we bought the microchip one. Gourmet cat tins for special treats. Cat biscuits – if Miles had his way this box would be removed from the cupboard and he would get three sachet’s of wet cat food a day instead. Toys – Catnip mouse on a string, ping-pong balls, wind up chick. Q3) Do you write a grocery list or do you shop off the cuff? A3) I very rarely write a grocery list. I am just not that organised. Creative people tend to be impulsive I find. Q4) What is the most used item in your kitchen? A4) Apart from my cooker itself I would say my wooden spoon. I don’t know how any cook can live without one. Q5) What do you have in your kitchen that may seem strange to other people? A5) This is a hard one. There isn’t anything that out of the ordinary in our kitchen. 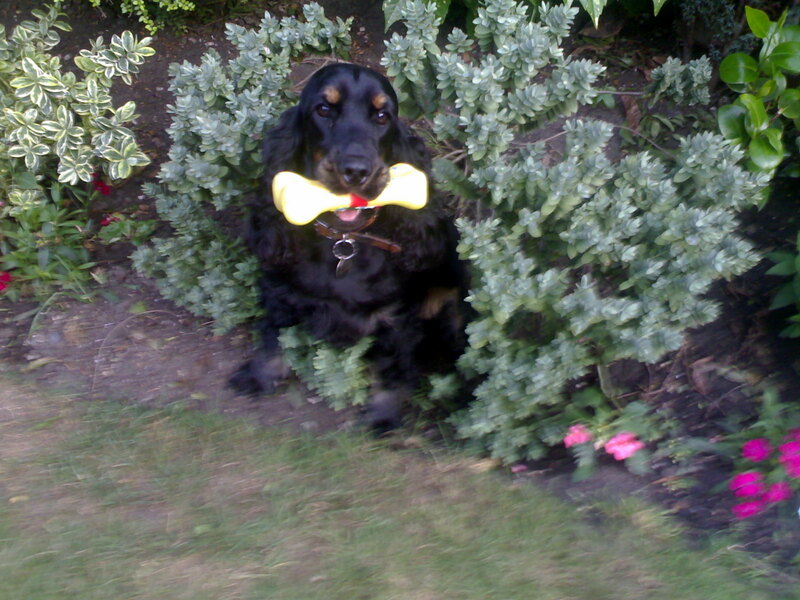 I do have photo of the cocker spaniel called Megan that my mum and dad had when I still lived at home. Unfortunately she died from spinal cancer at just four years old, which was traumatic for the whole family. My mum and dad have always had dogs but Megan was both the naughtiest and most loving dog I have ever known. She packed more mayhem into her four years of life than another dog could have done in fifteen years. She would bury half chewed pigs ear under our pillows for us to find later and once she even followed my husband into the mens toilet and took the opportunity to use the urinal next to him. There are countless hilarious stories of Megan’s adventures. Q6) If you were to enter a ‘Come Dine With Me’ challenge, what would you cook? A6) Starter – Breaded mushrooms with a garlic and chive dip. Main course– My famous seafood spaghetti, with muscles, prawns and clams, and of course lots of garlic and chilli. Dessert – Chocolate cherry brownie with home-made vanilla ice cream. Heaven! Q7) If you could invite any 4 living people in the world to dinner, who would they be? A) Bob Dylan because his music and lyrics are always an inspiration to me. Neil Gaiman because I am a literary geek and he never puts a foot wrong as far as I am concerned. Patrick Ness for the same reason and because his book ‘A Monster Calls’ totally blew me away. To add another lady to the mix I would invite Darcey Bussell because I met her at Wimbledon Book Fair and the sun always shines when she is in the room. Plus I love ballet. She would be forced to dance the black swan to Bob Dylan’s guitar, Neil Gaiman’s singing and Patrick Ness’ tambourine at the end of the meal though. My dream parties are always very surreal! Q8) What is your favourite breakfast out? A8) It would be my favourite lemon and sugar crepes with berries and cream at The Belgian Brasserie at Merton Abbey Mills. Q9) What one condiment could you not live without? A) Mint sauce. Roast lamb is not roast lamb without mint sauce. End of discussion. Q10) Some people seem to have a problem eating leftovers or reheated food, do you? A) Not at all. Some dishes mature with time. A day old risotto or tagine is always better than the first time round. And where would christmas be without leftover cold cuts? Fabulous! Megan sounds hilarious, and she was beautiful. I’m a dog person now because my husband is allergic to cats, unfortunately. But I have his thing for black and white cats and Miles is my favorite! Great post! Absolutely fabulous Emma. Thank you again for taking part in the fun. I just loved reading your answers. Happy first Blogoversary – what a lovely achievement and happy birthday to your darling Miles too – it’s lovely to know other people cherish their animal/s as much as we do. My hubby would definitely want to be at your dinner party with Bob Dylan, and I would just love to enjoy your fabulous menu. PS. I do I subscribe to your blog via email? I can’t seem to find the link thingy.